When it comes to automotive security, everyone wants to know about bulletproof cars. Bulletproof is such a definite declaration. However comforting this label may be, in our world, nothing is ever so simple. When something is deemed [Insert Vulnerability]-proof, what they are really saying is, it provides more resistances than you are liable to need. Whether it is unpickable locks or And that is what we are talking about today. A car that provides a level of resistance that is liable to save you from a gunfight, granted no one has come prepared with enough firepower to storm Fort Knox. But this is similar to what the secret service uses to protect the president of the USA. And though someone may be able to penetrate these materials one at a time, when everything works together, you will have a bulletproof car. Despite what movies may have led you to believe, standard car doors will not stop a bullet of almost any caliber. However, the doors of a car are by far the easiest part to bulletproof. This is because car doors come relatively empty and can be opened and resealed with new material inside. In order for this to work, the functionality of the door may need to decrease so that wires and electronics can be removed. The real trick, however, will be in the selection of materials you use to armor your vehicle’s doors and frame. You will also need stronger hinges and more securing bolts to deal with the weight of this new security. 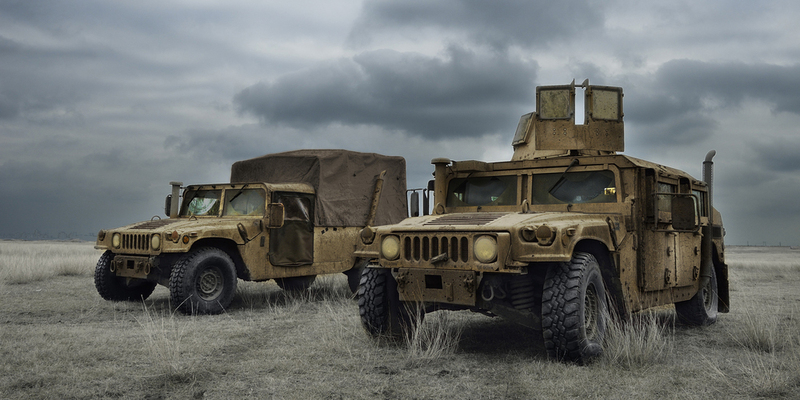 When a car is armored professionally, the doors are given layers of metal, kevlar, ballistic nylon, etc. Expensive, but reliable, materials. Essentially you would be building a bulletproof vest within the interior of your car door. On top of these inserts, there is also a thickening of the metal content of the initial metal. The layers may be separate from a welded thicker metal. This space allows for the bullet to disperse its energy before coming in contact with another boundary. This is all done on the inside of the door so that the appearance of the door does not appear different or special from the outside. Of course, for lighter armoring, composite materials can be used (similar to what is used in tank armor) so that the end result is lighter than steel without losing the protection. The more DIY approach to increasing the bullet resistance of your doors is to use more readily available materials to fill the doors. The best option in regards to weight and availability are phone books. Interlocking, stacked, phone books will provide quite a bit of bullet resistance just by themselves. Add the initial bit of metal your door already has, and you are left with an extremely safe and light door. Perhaps more readily available, but certainly more heavy is the option for small rocks. With just the housing of an old ammo container, a pile of rocks can absolutely stop a barrage of gunfire. They also stand up to tighter bullet groupings as rocks only turn to finer dirt and do not compromise as they are broken up. For panels that will be used within the body of the vehicle that needs to be cut to certain specifications, you can make your own composite armor out of many materials. Cheap bulletproofing can be done with simple sheets of ceramic tile, fiberglass fabric sheets, and resin. The fewer materials used, the less resistant the armor will be to firearms of varying calibers. 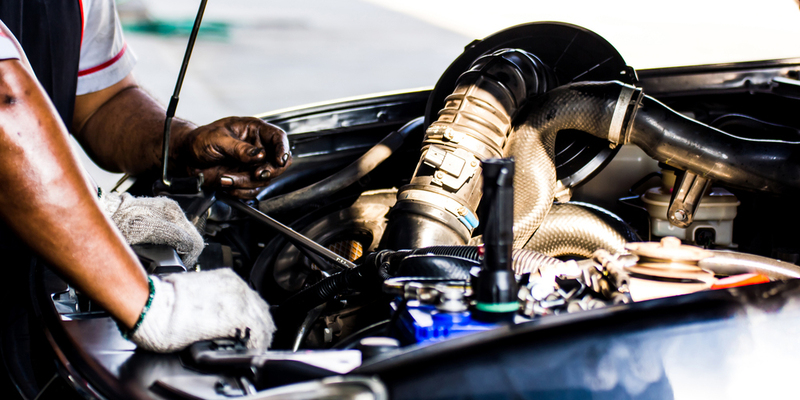 It is extremely important to make sure that your entire engine is protected. You want to be able to drive out of any situation that is unleashing a hail of gunfire. Even the most secure vehicles are not secure forever. There is only so much abuse bullet resistant material can take before getting compromised. For that reason, you need to protect every part of your engine. That means armor underneath the car as well. And redundant parts such as batteries are a must. But in either case, one of the best ways to protect your engine is to get something with enough horsepower to cope with the extra weight of the armored car. Because your engine needs to move the vehicle fast even before the first shot is fired. The focus begins with strengthening the front bumper of the car. Instead of allowing for the crumple zone, the idea will be to reinforce the metal so that there is no give. Not only with this provide a battering ram, which will assist in cutting through barriers in the path of the automobile, it will also keep bullets from interfering with the internals of the engine block. With all professional jobs, the idea is always discretion, so additional metal paneling and kevlar will be stacked under the hood. Much like what you would see in a movie like Death Race or Mad Max, the other option is to build out. These type of armor plates can either be stacked using layers of thin metal or use thick strong metals. This type of decision is up to your budget. Steel can be continuously stacked, sandwiching other materials in between, or you could invest in a large quantity of machined and shaped titanium. Titanium is going to give you a lot of bullet resistance. Building out is always necessary for under the car, but when doing it will less than professional means be sure not to extend down within scraping distance of the road. If the threat is coming from inside the vehicle, or the exterior is breached, there needs to be adequate cover within the car. That means bullet resistance for the seats and barriers within the automobile. Like most aspects of a bulletproof car, there is the need to balance practicality with defense. Remember that you will need to sit in these seats. Depending on how many people are going to be transported it may be necessary to include adequate space. Furthermore, padded interiors are needed to prevent head injuries during an altercation or escape where the vehicle is driven erratically. There are two main variations in professional interior bulletproofing. First off there is the permanent barrier set up. This is similar to something that you will see in prisoner transport vehicles such as police cars. The car is designed to anticipate a threat from within the car coming from occupants of the back seat. More often than not, these are meant to keep people from leaving the vehicle. For the barrier, if there is not a desire to interact or monitor the detained individual, there is thick metal plating. In most cases, there will be a pane of bulletproof glass so that the individual being transported can be viewed. The other version is meant for covert protection. No barriers are set in place as a default. In fact, the car is made up to look as though no precautions have been taken. Seats are covered with comfortable bulletproof fabrics such as kevlar or other ballistic fabrics. For added protection, there can even be metal inserts between the cushioning of the seats. This type of layering allows those inside to take cover even after bullets begin to enter the cabin. The main change in how someone would bulletproof the interior different than a professional is mainly in the materials used. The plates installed into the cushioning of the seats would need to be hand made. These plates can incorporate ceramics between fiberglass fabrics to retain a shape that can be angled and curved as needed. This process will be very similar to adding layers inside doors, except this will require more seamstressing than it will metal fabrication. And if all else fails, placing a bulletproof jacket on a seat will stop a bullet. Regardless of which method you use to secure your glass boundaries on your soon to be bulletproof car, there are things you need to consider. Most importantly is shoring up the areas where the glass meets the frame. 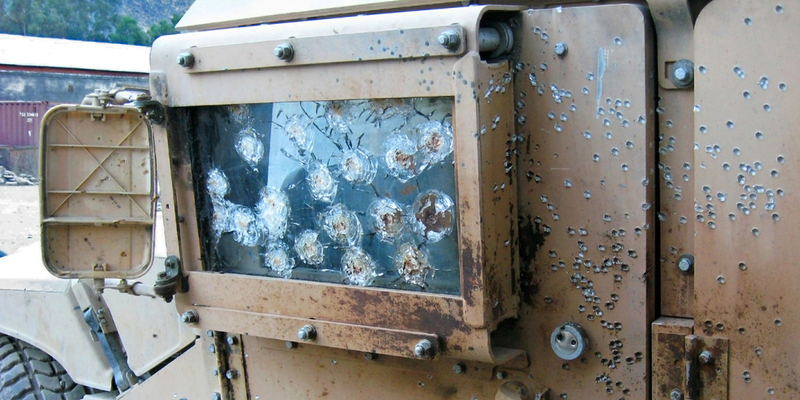 Without paneling there, these are weak points no matter what type of ballistics glass you use. These panes will need to be thicker than standard factory sheets, so it is important that the car is recalibrated to fit the new girth. If you desire the windows to function like those on a normal car, you will also need motors strong enough to move this heavier glass. However, it is not recommended that the windows go down past the necessary level for paying tolls or passing documents, as any gap for any amount of time is a vulnerability. Professional ballistics glass can be made in several different ways and in a variety of strengths. Most often it will be made with layers of ordinary glass and polycarbonate stacked in succession. The strongest types of professionally made bulletproof glass can weigh hundreds of pounds. Many advancements have been made in the clarity of these products resulting in a reclassification from glass to ‘transparent armor’. This glass is also no longer made with a fisheye perspective. In the past, glass this powerful would be hard to look through for extended periods of time. Now, that is no longer the case. The first way to alternatively achieve the bulletproof glass without having to turn to a professional source is to make the glass yourself. This is by far the most difficult DIY task. We are not only talking about a requirement of glass work (shaping at least, even if you are not making it from scratch), but we are also talking about chemical and fabrication knowledge. Some ways of making DIY bulletproof glass require stacking plastics and glass and chemically bonding the layers to keep the required clarity. Mistakes in binding elements or layer orientation will lead to unusable panes of glass (both as a result of clouding or fragility). The next option is by no means street legal. But if you have private property that you want to be protected while driving on, or are preparing your security for the end of the world, you might choose to use no windows at all. You could cover the entire car in metal armor and use cameras and interior screens to view the outside of the vehicle (à la the recent Batmobiles). Again, this is not legal (by current laws) for most uses. Cameras should also still have lenses placed behind some form of bulletproof glass, but these openings will require far less material. When a tire goes out, mobility is crippled significantly. Tires are rubber. Rubber is not a bulletproof or even bullet resistant material. When tires get shot, the rubber will puncture. But just because something gets a hole in it does not necessarily mean it is not bulletproof. As long as the device remains functional, it has thwarted the attack. That means that all you need from your tires is to move the vehicle after they have been struck. The way experts make a run-flat tire system starts with installing a horseshoe shaped insert between the rubber of the tire wall and the wheel. When the air pressure diminishes from the tire, the weight of the vehicle is shifted onto this device. Something like this will keep the car moving at a high rate of speed for up to fifty miles. These precautions are not built to last forever, just long enough. They are made as to not compromise the speed required to move away from danger. Achieving speed will also make the car more bulletproof. Because penetrating the armor of a car requires tight groupings of shots in the same area, moving quickly helps to disperse the impacts. The alternative methods are never as good as what the pros can do, and nothing proves that point more than the alternative to professional run-flat systems. What you are looking at for this type of method is filling the tire full of commercially available foam sealants. This type of protection will not hold up for the distance of the more expensive options, but it can give you the time you need to get out of the hail of gunfire. And that is all you can really ask for. The floor armor must be heavier than the plating on the roof. This keeps the center of gravity of the vehicle from being thrown off. Balance is extremely important to functionality. Never make a car heavier than it can handle. The reason you armor a car is not only to survive a lethal encounter. It is also important to escape it. No car stays bulletproof forever, so being able to get away fast is a necessity. The armored car industry is heavily regulated. The United States government wants to know who has an armored car. This is supposed to keep the bad guys from getting access to these vehicles. So there will be a vetting process if your car is made bulletproof by certified professionals. Discretion depends on your location. If your concern is being targeted, you will need to consider what a discrete vehicle is for your area. This will vary depending on the area or even country that you are traveling in. All armored plating must be angled. Resting bulletproof plates flat against a surface increases the ease of penetration. With angularly oriented paneling, there is a slimmer chance the full force of the projectile will impact the plate. You must guard your tailpipe. Believe it or not, Beverly Hills Cop was not lying to you. If you put a banana in your tailpipe, the car will not run. Placing a grate over this area will prevent this type of immobilizing tactic, while not clogging the tailpipe itself. The trunk can be a vulnerability. Whether you have a hatchback or a regular trunk, there should be additional security measures that provide more protection to these gaps in metal. Something as simple as movable plate barriers will do the trick. Driving a bulletproof car is not the same as driving a normal car. Very few people realize that changing so much about a car will also change the way it needs to be driven. Dealing with the weight differential is extremely important to high-speed escapes and evasive maneuvers. It is also important to know the correct driving tactics once you have been engaged by an armed adversary. Escape is what makes a car truly bulletproof. When too many rounds are fired in one location, any material will compromise. A door can never be bulletproof on its own, but if the door moves away from the bullets hitting it, then nothing will penetrate it. Same goes for glass or any other bullet resistant precaution. No security is perfect. This is one of the reasons most people don’t care about security. All locks can be picked and even theoretical extraplanetary security can be broken with enough time and strength. But when it comes to bulletproof cars, there is certainly a better chance of making something close to perfect. Using a mix of incredibly resilient ballistic grade materials and a moving fortress, you can defend and escape. Defense protects from the dangers of the initial unpredicted event. Escape removes the possibility from attackers from being able to achieve their inevitable success. This is how you make a bulletproof car.